As I wrote in a previous article - I can't find any information about this building on the Web. The only details that I have is that the building is called "Die Oude Molen" (where "Die" means "The" in English and not "die"), and it has the dates 1925 and 1710 embossed on a beam and at the top of the gable, respectively. If you know something about this house or property, please do leave a comment on this post. Posted in General and tagged history, house on Tuesday, 21 June, 2011 by Paul. This property overlooks the bay that you saw in my previous photo. The properties in this area as of the most expensive in the country, and given the view, I guess you're able to understand why. Many of the expensive properties on the Atlantic Seaboard, if not most, aren't owned by South Africans. Many are owned by UK, German or Dutch citizens, and many spend most of the year empty (which is such a shame). 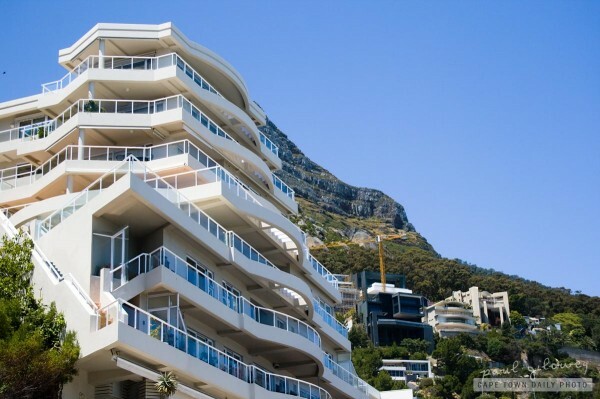 A few years back our government started making it more difficult for foreigners to purchase property in South Africa. The good thing about that is that it prevents our foreign friends from quietly turning Cape Town into a part of Europe ;), but it's bad from the perspective that it reduces foreign investment in the country. Kind-of a catch 22; don't you think? Posted in General and tagged house on Friday, 26 November, 2010 by Paul. As promised, here's another photo taken in Joostenbergvlakte. 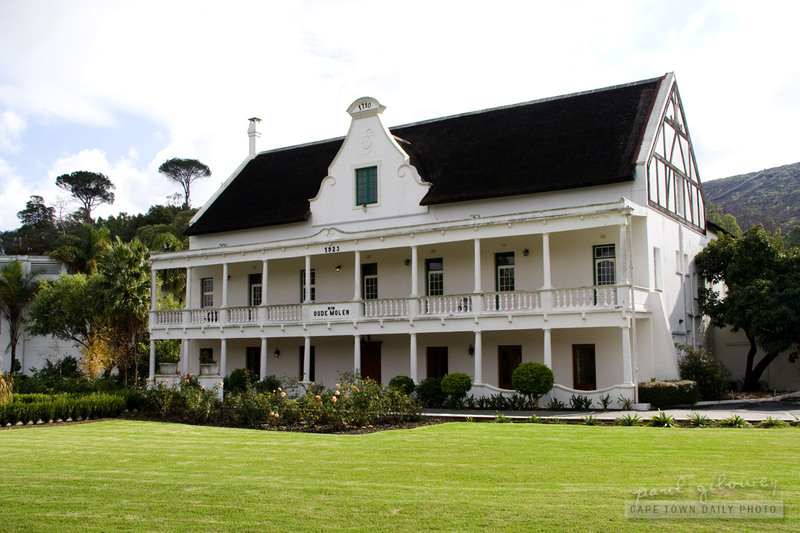 The suburb has an odd mix of large, lavish houses and smaller, less beautiful places like this one. Did you notice the barbed wire surrounding the property, the dirty walls, the rugged driveway, the old house? 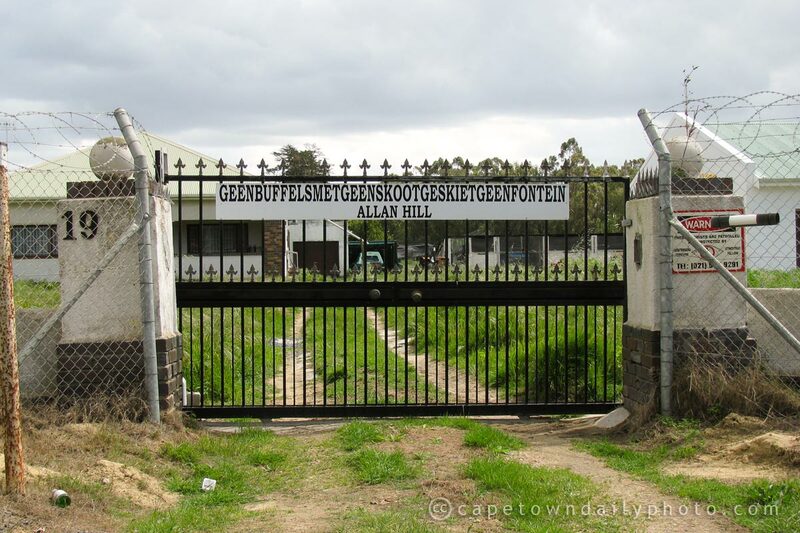 Perhaps you did, but I bet you couldn't help but notice the enormously-hugely-oversized Afrikaans name on the gate: "Geenbuffelsmetgeenskootgeskietgeenfontein". While it may look weird to foreigners, the lack of spaces between words, and the length and make-up of the name is considered rather amusing in South Africa. Loosely translated the name of this property reads "No-buffaloes-shot-with-no-shots-no-fountain". It looks a little weird because it's a play on the more common (yet equally amusing) farm name, "Tweebuffelsmeteenskootmorsdoodgeskietfontein", which translates as "Two-buffaloes-shot-dead-with-one-shot Fountain" (where "fountain" refers to the spring of water often found on farms). Read the Wikipedia article here. Posted in General and tagged house, language, sign on Monday, 28 September, 2009 by Paul.